This two-volume, A-to-Z encyclopedia provides detailed coverage of America’s business history, from the Hudson fur trade to the Internet. More than 400 lively, informative entries profile corporate titans and tycoons, Wall Street wizards, industry leaders, and major events and institutions of American businessspanning the period after American independence to the present day. Each entry is accompanied by a short bibliography and is cross-referenced to related entries, enabling readers to pursue the topic further. An introduction offers a general account of the topic, and a chronology helps readers place events into historical context. Selected primary documents, a general bibliography, and an index round out this important reference. "...a worthy resource...recommended for high school, public, and general undergraduate libraries." "The quality of scholarship is good, and the list of contributors is impressive, resulting in excellent coverage of business issues and individuals. The rapid pace of change in the field of business, especially the globalization of the marketplace, makes this encyclopedia a worthy addition to any business collection." 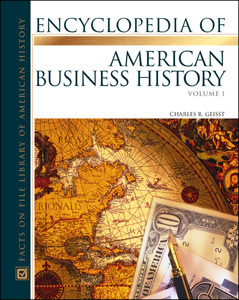 "If you're a high school, college or public reference librarian seeking a 'one stop' instruction to American business history which is accessible to a wide audience, look no further than Encyclopedia of American Business History." "Encyclopedia presentation, as opposed to narrative format, has an advantage in enabling ready access to topics of interest, as well as highlighting points of significance from the myriad of influences that have shaped American business." "Each entry is written in a lively, informative style...comprehensive...Enticing biographical sketches...Complex economic and financial processes are thoroughly explained, thus rendering this set useful for beginning business students."